Researchers have found white dwarf stars with masses close to the maximum stable mass (called the Chandrasekhar mass) are likely to produce large amounts of manganese, iron, and nickel after they orbit another star and explode as Type Ia supernovae. 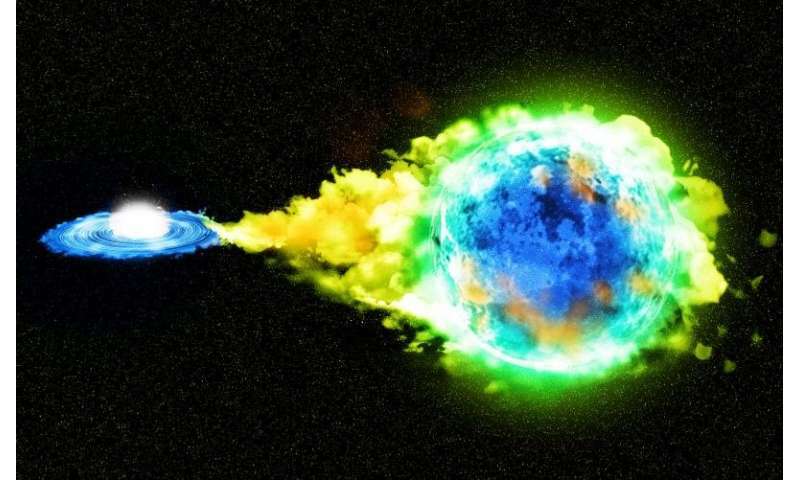 A Type Ia supernova is a thermonuclear explosion of a carbon-oxygen white dwarf star with a companion star orbiting it, also known as a binary system. In the universe, Type Ia supernovae are the main production sites for iron-peak elements, including manganese, iron, and nickel, and some intermediate mass elements including silicon and sulfur. 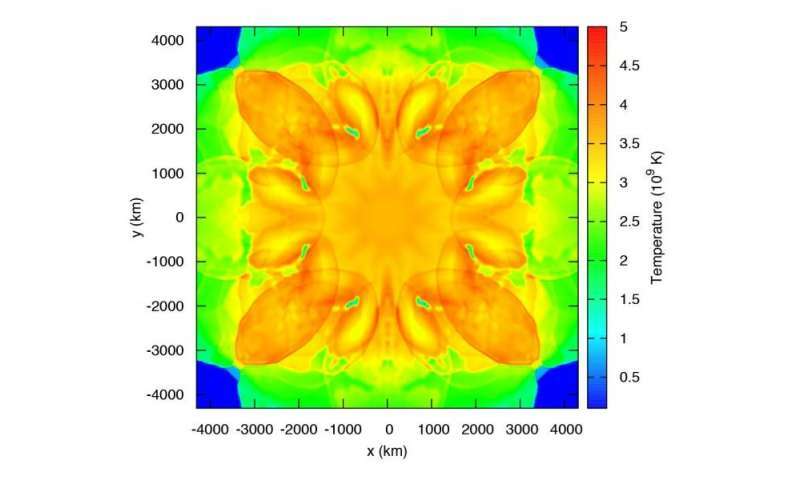 To uncover the origin of such diversities, Kavli Institute for the Physics and Mathematics of the Universe (Kavli IPMU) Project Researcher Shing-Chi Leung and Senior Scientist Ken'ichi Nomoto carried out simulations using the most accurate scheme to date for multi-dimensional hydrodynamics of Type Ia supernova models. They examined how chemical abundance patterns and the creation of new atomic nuclei from existing nucleons depend on white dwarf properties and their progenitors. "The most important and unique part of this study is that this is so far the largest parameter survey in the parameter space for the Type Ia supernova yield using the Chandrasekhar mass white dwarf," said Leung. 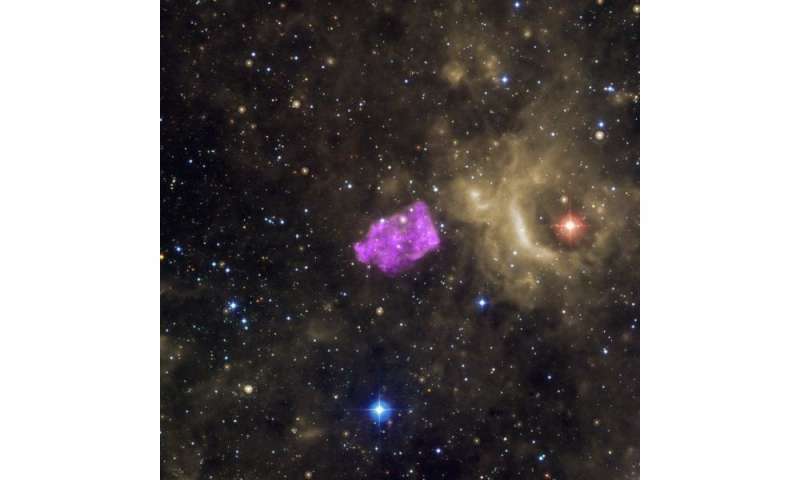 A particularly interesting case was the supernova remnant 3C 397. 3C 397 is located in the Galaxy about 5.5 kpc from the center on the galactic disk. Its abundance ratios of stable manganese/iron and nickel/iron were found to be two and four times that of the Sun respectively. 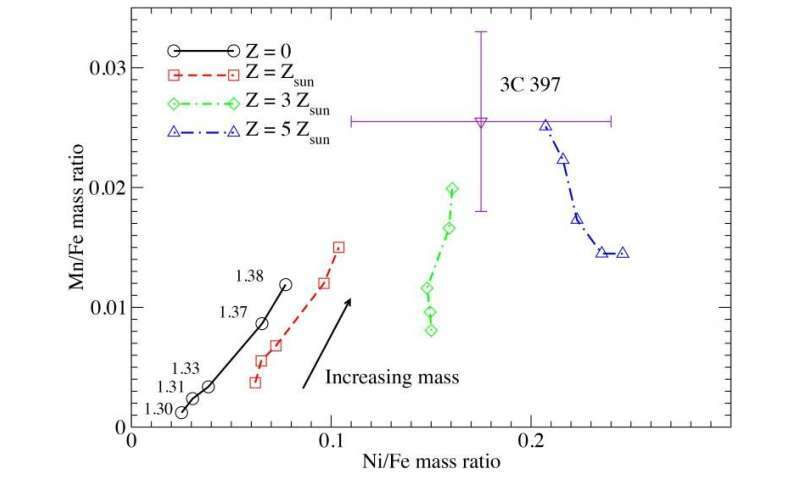 Leung and Nomoto found the abundance ratios among manganese, iron and nickel are sensitive to white dwarf mass and metallicity (how abundant it is in elements heavier than hydrogen and helium). The measured values of 3C 397 can be explained if the white dwarf has a mass as high as the Chandrasekhar mass and high metallicity. The results suggest remnant 3C 397 could not be the result of an explosion of a white dwarf with relatively low mass (a sub-Chandrasekhar mass). Moreover, the white dwarf should have a metallicity higher than the Sun's metallicity, in contrast to the neighboring stars which have a typically lower metallicity. Figure 3: Distributions of representative elements ejecta velocity in the typical Type Ia supernova after all major nuclear reactions have ended. Colours represent the sites where the corresponding elements are produced. The arrow indicates the motion of ejecta’s. Credit: Leung et al. Figure 4: The 57Ni against 56Ni for the models presented in this work. 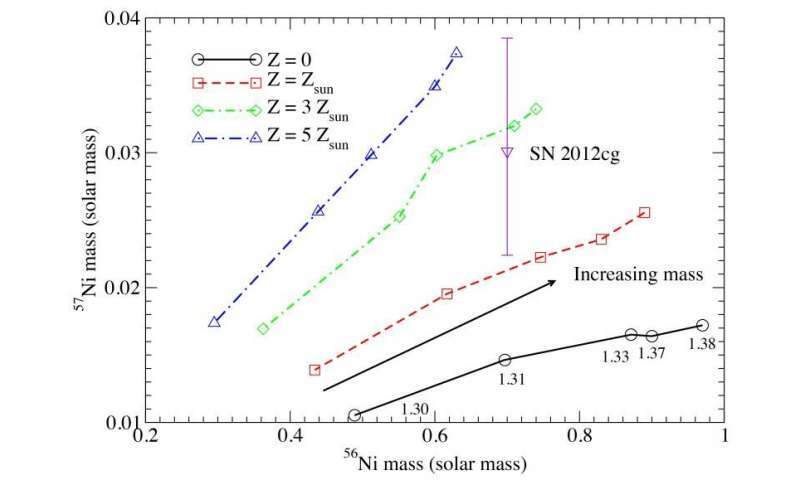 The observed data from Type Ia supernova SN 2012cg is also included. The data points along the line in the described direction stand for white dwarf models of masses from 1.30 to 1.38 solar mass respectively. Credit: Leung et al. 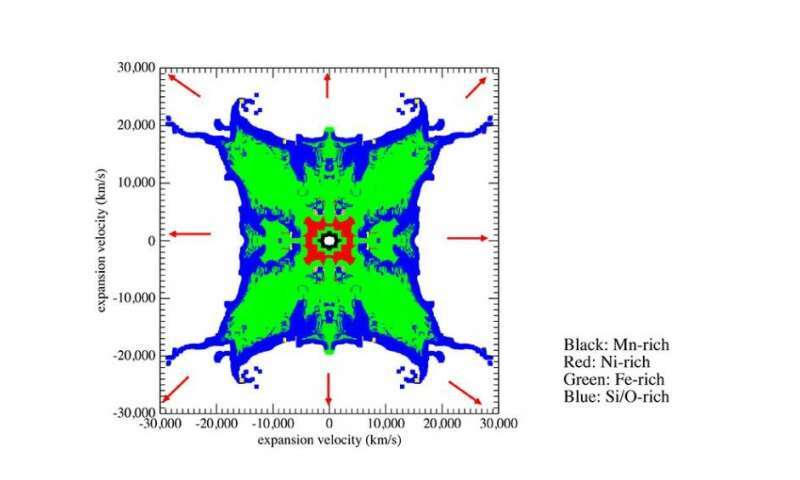 Figure 6: Mass ratio Mn/Fe against Ni/Fe for the models presented in this work. The observed data from Type Ia supernova remnant 3C 397 is also included. The data points along the line in the described direction stand for white dwarf models of masses from 1.30 to 1.38 solar mass respectively. Credit: Leung et al. Interesting! The authors investigate at about 5.5 kpc distance and make a conclusion. At the same time, authors do not see the difference in the chemical composition of Earth and the Sun. Most of the bodies in the orbit have a higher percentage of metal than Sun. If authors do not see this, how can we believe (in their) results in about 5.5 kpc. Science is the observation of the whole. Science is not observing the fragments of the whole (without observing the whole). Everything (about the article) speaks "are likely to produce large amounts of manganese, iron, and nickel after they orbit another star and explode""
oh dear duck. Do you understand that when Our Sun and the surrounding protoplanetary disk of cosmic crap began to materialize? That out of the prevenient moshpit of supernovae, Sol got a different set of elements than what separately coalesced as the surrounding junkyard disk from the leftovers in the chaotic nebulae. The elemental materials that make up the planets did not get birthed from Sol. Cause that'd make the Sun a female fertility goddess. And Judea-Cristian-Sunni-Han civilization would come crashing down at such a horror being possible! While those fuckung Japs would be enjoying themselves. Snickering as they watch our societies collapse. Obfuscation much with regards to your nasty-nasty? Societies collapse out of the choices made by those who believe themselves to be the Elite, or have a membership in it. In some circles here in the States, the term "Japs" is a euphemism for "Jewish-American-Princess(es)". But, who knows? They just might be snickering at the coming collapse of society once the Democrats win both Houses of Congress this coming November. But IF and when that happens, we can all kiss US scientific research goodbye, for that funding will have to meet the Democratic Socialist projects to provide sustenance of every kind for all of the illegals who are here in the States already, and all of those who are yet to arrive. And when Socialism fails, the Snowflakes will cry again while demanding puppies and toys to soothe their mental booboos. I can almost predict that they will demand the return of Barry Obama as US President. Which part does not you understand: the formation of a body due to the collapse of the gas cloud or the formation of a body as a result of constant growth (gathering)? Perhaps your Sun originates from one supernova and bodies from the other? Maybe every body came from another cloud and other supernovae? I almost forgot: the chemical composition of the gas clouds is similar (or less varied) to the chemical composition of the stars. According to your science, the planets and other bodies are complete aliens in our system. Forming a body does not depend on elections for the Senate. The votes can not change the evidence. There is also a possibility that there was a supermassive Star long before our Sun came into existence. The supermassive Star, after using up all of its fuel exploded as a superdupernova and the planetary bodies that had been orbiting that Star were all sent flying into our location. Those planetary bodies floated around and some collided with each other since they had no permanent orbits yet. Then the disk of dust and gas began to compress, causing temperatures to rise which, in their turn, began to cause a chain reaction in the radioactive dust/gas such as molecules of Uranium and Deuterium, etc, which then resulted in the highest temperatures for Fusion to begin in Hydrogen gas. That is when the Sun was born. The planetary bodies that had been kicked out of their normal orbits then, due to the influence of the new Sun, began to make new orbits around the Sun. well segue, I have discussed the pretentious nonsense of you altright fairytails with my father's kinfolk. The general consensus seems to be? That mu family owes the American Nation an apology. For our great-greats accepting the bribes from your gramps. Letting you foreign scum sneak into our country. I agree that you unnatural illegals should be rounded-up and shipped back to your ancestral cess-pits. You can resume your heritage as honey-pot collectors and pulling the plow on your divinely-ordained master's fields. Certainly help clear out the miasma stench of treason and sedition that follows you about. Nice comment, but unfortunately beyond the evidence. Only part of "some collided with each other" can be realistic (within the constant growth of the body). Alternatively, ducks, none of you really exist and are only a figment of my imagination.